Funeral services for Mildred Martha Rood, 90, will be at 1 p.m. Thursday at Warren-McElwain Mortuary in Lawrence. Burial will follow at Oak Hill Cemetery in Lawrence. 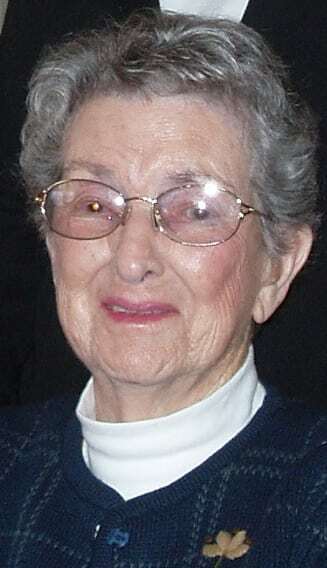 She died Monday, Sept. 26, 2011, at Lawrence Memorial Hospital. She was born Sept. 29, 1920, in Berlin, Okla., the daughter of Roslin and Mattie Seetin Skinner. Mrs. Rood was a homemaker. She married Ralph Bert Rood on May 8, 1937, in Lawrence. He preceded her in death Sept. 17, 1994. She was also preceded in death by nine brothers and two sisters. Survivors include two daughters, Judy Palmquist and husband Douglas, Cassville, Mo., and Kathryn Pine and husband Marvin, Lawrence; two sons, Jim Rood and wife Terry, Lawrence, and Stan Rood and wife, Patti, Tonganoxie; eight grandchildren; and eight great-grandchildren. The family will receive friends from 4:30 p.m. to 6 p.m. Wednesday at the mortuary. The family suggests memorials to Multiple Sclerosis Society – Eastern Kansas Chapter, sent in care of the mortuary, 120 W. 13th St., Lawrence, KS 66044. Online condolences may be sent to warrenmcelwain.com.